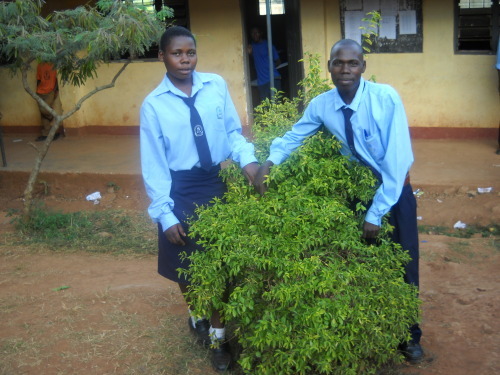 Kasuja Moses, a shining example of perseverance in spite of adversity — Educate! | Preparing youth in Africa with the skills to succeed in today’s economy. Born in Kitongo Kassanda in the Mubende District, Kasuja Moses is an Educate! scholar did not allow the passing of his father—the main bread winner and sole school fees provider of the family—to deny his pursuit of an education. When Kasuja lost his father in senior one, his relatives convinced him to stop his education and, instead, advised him to look around for small jobs in the village so he could support himself and his family. Kasuja dropped out of school and got a job in the Wamula Union factory where he was earning 25,000 shillings a fortnight. He supported the family on this meager income, but he also began to put money aside as well. In time, Kasuja managed to save enough money to buy one piglet. After about a year, he earned enough to be able to go back to school. Kasuja now has seven pigs and a poultry project that generate enough money both to pay his school fees and also to support his sister, who is a student at Katuuso Community Academy in Kampala. The pig and poultry projects are not without challenges, however. The biggest obstacle is getting enough capital for expansion as the proceeds from the business mainly pay for his school fees and other school requirements. He is hoping to find donors who can provide him with a soft loan to expand his business so that he can work on economies of scale. He also wishes to get in touch with other people who are involved in poultry and pig breeding to provide him with advice on the best practices so that he can improve on his projects. Kasuja advises that his peers be resilient and focused and not allow themselves to degenerate into self-pity because of the tragedies they face in life. He suggests that the youth always take any employment opportunity, provided it does not expose them to any kind of risk. He also encourages students to develop the culture of saving because it is the best way to mobilize capital. Kasuja hopes to be a prosperous entrepreneur after completing his studies. Emily, our first Country Director, reflects on her time at Educate!